Use Miracle-Gro Potting Mix 2 Cu Ft to give your indoor and outdoor container plants and flowers the right ingredients to grow bigger and more beautiful. This specially formulated soil mix feeds plants for up to six months. 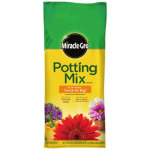 This organic potting mix nourishes your plants to help promote more blooms and bright colors. Whether you are planting decorative pots for your patio, deck or front porch or want to brighten up an indoor space, this powerful soil feeds and fertilizes your plants to give you lush, healthy plants wherever they grow.